For many of the Clergy of Wicca, Druidry and Paganism, a pin is needed when ministering to the faithful. More often than not, entering a hospital or other institution requires a bit more formal attire than typical street clothing. For such occasions where one needs to look one’s best, this Pagan Clergy Pin can be recognized and still look professional in a business suit or uniform of a Chaplin. 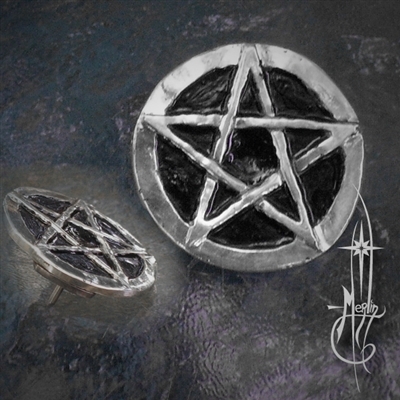 The Pagan Clergy Pin is a solid piece (Sterling Silver or Bronze) with a black background and easily mounted with two tack pins behind the disk. It is accompanied with the tie tack backs needed to secure it on your lapel jacket or other garment. This is intended for those who serve the community, no other identifying mark is included, making the pin a universal symbol for all Earth Based Religions. To see and order your Pin, please visit my Pagan Clergy Pin page.